Whether you are looking for office space for your growing startup or a large room for an executive meeting, the Lacey Conference Center offers a variety of rooms and services that are sure to meet your needs! We have a total of 6 different conference rooms to choose from all varying in capacity from 1 to 100 people. To our business owners, we offer longer-term options that provide a steady meeting space or office with flexible leases. 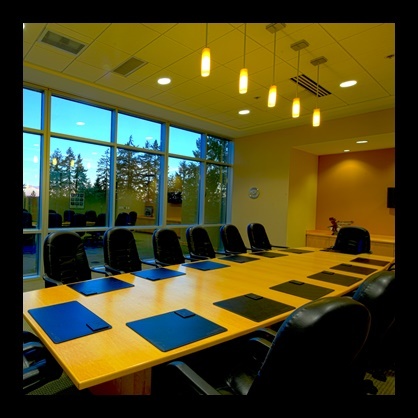 The options include the Executive Suites, Lacey Business Center, and our Virtual Offices. Need a quality space but don’t want to pay an astronomical price for it? We’ve got you covered! At the Lacey Conference Center, you will be able to find spaces of varying sizes at some of the best prices in town. Our office spaces are furnished and ready for move-in. In addition, we have tables and chairs available for use when you rent our conference spaces. We'll even accommodate requests for desired layouts if you have one in mind! The Lacey Conference Center is much more than just a conference center. Need help promoting your next event? Want to create a website for your business? We’re here to help! No need to rent any extra equipment for your next event. With our conference spaces, everything from set-up to audio is included in our pricing. No strings attached!